Why We Call it Vactionland! 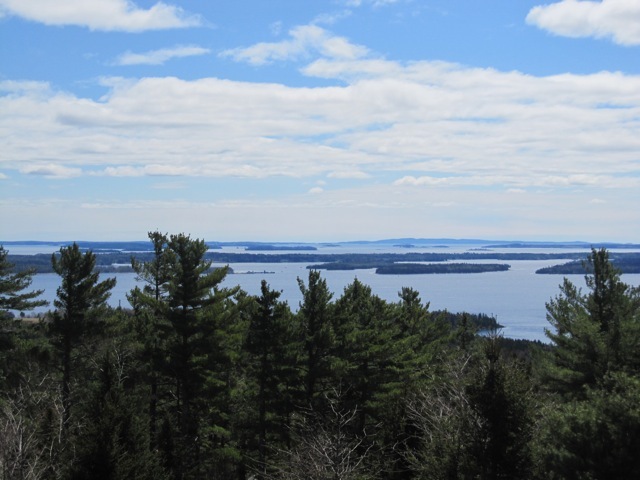 Over 80% of Maine - that's about 17 million acres - remains forested with a beautiful mix of white pine, hemlock, spruce, fir and a variety of hardwoods. Between the breeze coming off the ocean and the naturally air purifying nature of trees, it not only looks good here, it smells good too! Our 2014 season came to a close on 10/29 as we put the "Cow" to bed for the winter. We'll miss all our wonderful customers but look forward to seeing everyone in the spring as we celebrate our 75th year! Don't forget that you can shop online throughout the year. The prizewinner for November 2014 is Stephanie from Pittsburgh, PA. We'll be sending Stephanie our new Parade of Deer balsam pillow. Congrats! Our prizewinners are chosen at random from our email list... next month could be YOUR turn! We are now open from 9AM-9PM Mondays thru Saturdays and 9:30AM-9PM on Sundays... summer is here! As of Labor Day we have moved into fall schedule with open hours Monday- Saturday 9:30-5:30 and Sunday from 10-5. This is such a great time to be in Maine: a bit quieter, a more relaxed pace of living and beautiful weather with warm days and cooler nights. Lots of events going on and plenty to do. We love this time of year! What an amazing season our 75th was! Beginning with our opening celebration in April and continuing with contests, giveaways and visits from old friends and former employees, we celebrated the whole season long. We are so grateful to still be family owned on beautiful Main Street in Camden. We look forward to many more years right here where the mountains meet the sea. Many thanks to our wonderful friends and customers who have made The Smiling Cow a Camden, Maine tradition for 75 years. Our 75th Anniversary celebration last year was GREAT! Now we're busy getting ready for our 76th season, which begins on Saturday, April 16th with hours from 9:30am - 5:30pm, 7 days a week. We've got all your favorite items, and, of course, our delicious fudge, along with a mix of exciting new products that just might become your new favorites. We can't wait to greet our old friends and new customers and hope you will come visit The Smiling Cow very soon. We're in full swing with our summer hours now from 9AM-9PM seven days a week! So great to have warm evenings again when you feel comfortable walking around town after dinner, getting an ice cream cone and visiting us. Fall hours have begun, and we are now open from 9:30-5:30 Monday through Friday and 10-5 on Sunday. Such a beautiful time of year to visit Maine and Camden is lovely as we move towards fall foliage season. A quieter pace but still so much to see and do here, and the weather has been quite warm this September. The Smiling Cow is now in hibernation for the winter! Thanks to all our customers and friends for making this such a banner season. My thanks to the incredible staff of Cow Girls who contribute so much to our success... they are a pleasure to work with! We will be busy planning and buying during the winter months to get ready for a new year and will open in mid April to begin our 77th season here in Camden. Happy winter to all and see you in the spring!